I don't know about you, but I am so looking forward to watching Alice and Wonderland this weekend. What would be a more perfect way to celebrate, than to host a tea party!? I found this really great bakery online. They are based out of LA. Too bad they are a little out of my way :( If any of you do live in the area the Tea Party Curio Box could be something you may be interested in. 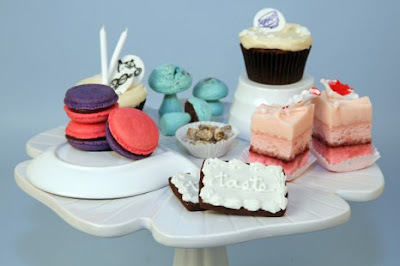 It is filled with an array of delicious morsels, macrons, cookies, cakes. It is super pretty too! For further info click here.